I'm not sure if it's related to this one, but I have a similar problem. The problem is unless I have port 27017 opened, Robomongo fails to connect even with "ssh tunnel" option. 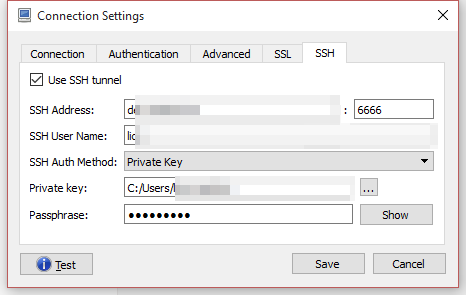 Port, address and public key are correct, I'm using the same credentials to connect through ssh. Looking at the traffic in wireshark I see that Robomongo doesn't try to connect to 27017, it connects to 6666 (as it should), but still fails. Perhaps you are using a version of mongodb that is not supported by Robomongo. See this answer about Robomongo not supporting Version 3.0 of mongodb yet. Not the answer you're looking for? Browse other questions tagged ssh iptables mongodb ssh-tunnel or ask your own question.